Philippe Starck is a very well known designer who seems to be up for handling industrial design on just about any product that catches his eye. This time around he's teamed up with Parrot, makers of a wide variety of wireless devices, to create a pair of wireless speakers called Zikmu. Parrot announced the Zikmu last month, but they are here at Macworld Expo showing them off in person, and I have to say they look rather striking. 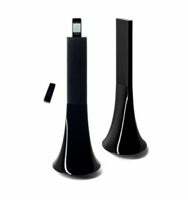 There are two ways to use the Zikmu speakers: one of the pair has an integrated iPod dock that you can slip your iPod or iPhone into which allows you to play music right from the device itself. You can also use Wi-Fi to stream music from your PC or Mac directly to the speakers. The two speakers communicate with each other using Bluetooth, so you can place them anywhere in a room without having to worry about tripping over wires. The Zikmu speakers will be available in Spring 2009 for $1,500 because good design costs a good amount of money (or so it seems). Then again, we Apple fans are used to that kind of thing, right?